My Newly Re-sewn and Newly Sewn Top ~ Fun Food Life! Vogue 2074 is a close fitting, wrap or mock wrap top (in three lengths) that includes above elbow or long sleeves with stitched hems. 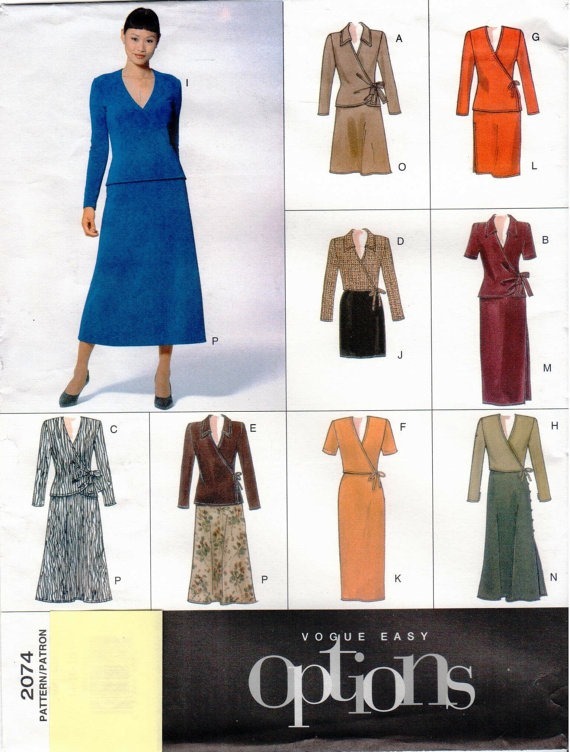 The pattern also includes straight or A-line skirts in three lengths (mid-knee, below mid-knee, above ankle) with a contoured waistline and a back zipper. I sewed two versions of the top. 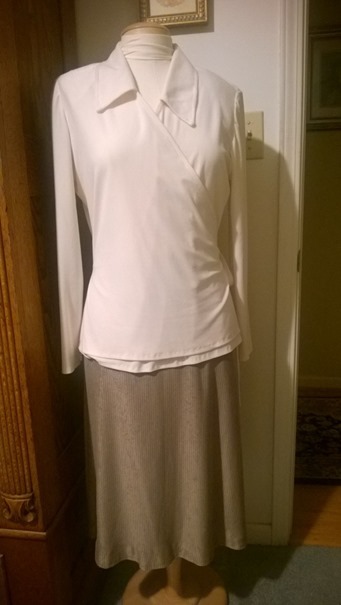 Cream top: I originally sewed version E in a cream polyester double knit about 15 years ago. The wrap top includes ties that are sewn at each side seam. The ties are tied together at the left side. The longest tie is sewn at the left side seam and is threaded through a hole on the right seam and then wrapped around the back on the outside of the top to meet up with the right tie at the left side. 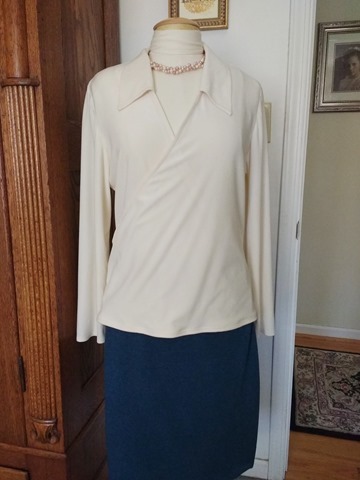 When I originally sewed this top, I included shoulder pads with it. I didn’t sew the pads onto the top, instead I added snaps on the pads and along the shoulder seam lines so I could easily remove the pads when I laundered the top. The top I originally cut and sewed was too large, so I needed to take it in before I could wear it again. I never liked the way the wrap ties worked or looked, and I didn’t like the way I had to feed the tie through the small hole on the right side seam. I also didn’t like how the tie looked when it was wrapped around my back. The top was way too fiddly to suit me. I only remember wearing it two or three times. The top had been hanging in the back of my closet for years. I ripped out the side seams, removed the ties and sewed the side seams back up to form a mock wrap top. When I sewed the seams, I took the seams in by about an inch on each side. I also permanently retired the shoulder pads – I have broad shoulders and never needed them in the first place. I was so happy with my new old top that I decided to make another one in teal. 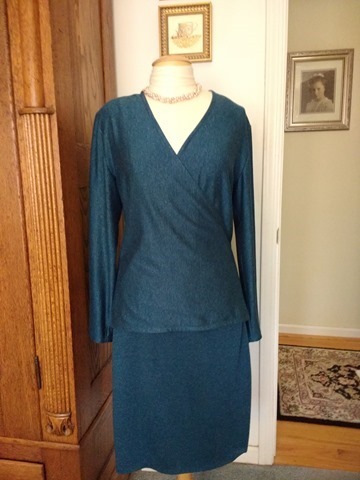 Teal top: This time I sewed the mock wrap version (version I). This version is a few inches shorter than the wrap version. Since I preferred the wrap version length, I cut out Version E, but modified the side seams to match the seams in the mock wrap version pattern pieces (the side seams flare out a bit more). I also didn’t include a collar and cut out the smaller size. Wrap tops are stylish and classic – they don’t go out of style – and I think they flatter small busted women like me. I especially like well designed mock wraps because they look like wrap tops without all the fussiness.